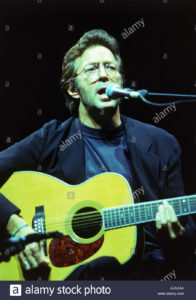 I happened to see that Eric Clapton, one of my husband’s real life guitar heroes was in town this week. We grabbed some last minute tix near the stage at the Gwinnett arena and had the most incredible night. Along with thousands of other blue-jeaned baby boomers, we were transported by his brilliant riffs. Clapton took us through a journey of his music through the decades. He was very different from the opening act, Roger Daltry (clearly the extrovert ). He never introduced the songs (we all knew them anyway) and only spoke softly to name the band members after their solos. He didn’t put on foolish grins or try to win us over. He simply was himself, a gifted musician, clearly in his own world. He let his talent speak, or rather play, for itself. Clapton grew up an introvert. He spent many hours alone with his guitar dealing with a rough childhood, honing his gift. Later, he battled alcohol and drugs. None of that mattered last night. The man and his guitar shined with a quiet grace. I am so grateful I was there to witness it. This entry was posted in introvert and tagged baby boomers, Clapton, introvert, introverted leader, Introverts, kahnweiler on March 10, 2010 by Jennifer Kahnweiler.